Official softball and unified track & field practices start on Monday, March 4th. All students interested in the joining the unified team or trying out for the softball team MUST have all the needed paperwork completed and submitted to the athletic department in order to practice. You can see Mrs. Shrock in the athletic office to check on your status. Those interested in softball can also check in with Mr. Kulp, and those interested in unified track & field can see Mr. Smuts. Get involved! Official girls tennis, boys golf, and baseball tryouts begin the following Monday, March 11th. If you are a sophomore or junior and are interested in participating in our next Europe Art Trip, there will be a general call out meeting for you and your parents on Tuesday, March 5th in room 1010 at 6:00 p.m. NOTE: You do NOT have to be an art student to enroll in this trip. Please see Mr. Zuber in 8080 (or Whiteman Hall) for details. On Thursday, March 7th at 7:45 a.m. there will be a planning meeting for prom in room 8080. Please see or email Ms. Poling with questions. Any junior or senior is welcome to attend. Attention Students: Herff Jones will be here on Thursday, March 7th during SRT to take class rings orders for any grade, and for senior orders for caps and gowns, graduation announcements, and other senior items. Extra packets are available in the main office. Attention Seniors: Indiana University Purdue University of Indianapolis (IUPUI) will have an onsite admissions day on Thursday, March 7th from 9:00 a.m. to 12:00 p.m. To apply please go to https://sisjee.iu.edu/sisweb-prd/ad-rev/welcome/?urlSource=BL. Ivy Tech Community College will have an onsite admissions day on Tuesday, March 12th from 9:00 a.m. to 12:00 p.m. To apply please go to https://www.ivytech.edu/apply-now/index.html. Please make sure to apply before the dates mentioned above. It is very important to have the essay done for IUPUI and also have the application fee paid if it corresponds to you. If you have been accepted and have questions this would also be a great opportunity to take advantage of. If you have any questions, please email cvillalobos@goshenschools.org. The Winter Sports Recognition Program is on Tuesday, March 12th in the main gym at 7:00 p.m. All winter student athletes are expected to attend and to bring your parents. Thanks for all your hard work. Come and celebrate with us! Goshen Youth Soccer Organization (GYSO) is looking for any high school student who would like to coach a team in grades K-8. You do get paid $100 for coaching. The commitment is two nights a week starting in April after spring break and goes until the first week of June. Sign-ups will be on the bench outside of the athletic office. If you have any questions, contact Coach Wildman by email at kwildman@goshenschools.org. Intramural volleyball sign-ups are underway. You can pick up a team registration or an individual registration from outside of the athletic office. You can turn in completed forms to Lucas Kauffman. The Cpl. Aaron L. Seal Memorial Scholarship is in the guidance office. You must possess a minimum GPA of 3.0 to qualify. Football Players: Off-season workouts will be held on Mondays and Thursdays from 3:45-5:00 p.m. Mondays we will lift together in the weight room. Thursdays we will be in the warehouse. Please be dressed and ready to go. We will meet in the warehouse. You must have an athletic physical on file in order to workout. Attention anyone interested in playing football in the fall…there will be a call out meeting during the 2nd session of SRT on Tuesday, March 5th in the main gym. Please bring your laptops and something to write with. ATTENTION GERMAN AND FRENCH CLUBS: We are having a dodgeball match for our next meeting! Come to Whiteman Gym on Tuesday, March 5th during the 2nd session of SRT to represent your club and claim European dominance. Due to ISTEP we are postponing the Art Club meeting until the 2nd session of SRT on Thursday, March 7th. There will be a call out meeting on Tuesday, March 12th for any girl interested in volleyball during the 2nd session of SRT in the main gym. Please contact Coach Howard if you have any questions. There is a call out meeting on Tuesday, March 12th during the 2nd session of SRT in Whiteman gym for any boys who are interested in playing soccer next year. This includes any freshmen, sophomores, and juniors who were on the team from last season. Boys & girls varsity track and field will compete in the Wildcat-Giant Invitational at 10:00 a.m. The Goshen RedHawks lost to Plymouth in the Elkhart Sectional 50-43 to finish their season 8-15. Bryant Robinson led Goshen with 24 points. Goshen Community Schools is implementing an electronic application (App) for use on parents’ smartphones. The App, SafeStop, will let parents and students monitor where their assigned bus is as it performs its’ route. We have links to the user guide on our website under the transportation tab. For all elementary students, we will be sending home a paper copy of the user guide. We have been beta testing the app since December. This app only works for students that are assigned to ride a GCS bus and works using the one bus stop assigned to them. This means that only the parent/student has access to the app. No one else will be able to access it without a student id number. If you have moved or your student is at a babysitter, you would have had to inform the transportation office of this change so that the information could be updated. As you know GCS is currently experiencing a bus driver shortage and at times we have had to double up routes using existing buses or split students among different buses. In these cases, the app will be unable to be used to track the bus that is not in service for the day. The app has the capability for the transportation department to push out notifications to specific bus routes, so our communication about changes should be improved. As with any new program, we ask for your patience as we implement this program district-wide. The number for the transportation department is (574) 533-7176, please call us with concerns. La Corporación Escolar de Goshen está implementando una aplicación electrónica que los padres de familia pueden usar en sus teléfonos inteligentes. La aplicación, SafeStop les permitirá a los padres de familia y a los estudiantes monitorear en dónde se encuentra su autobús asignado mientras realiza su ruta. En la pestaña de transporte de nuestro sitio Web, encontrará enlaces que lo llevarán a la guía del usuario de esta aplicación. Asimismo, enviaremos una copia impresa de la guía del usuario a la casa de los estudiantes de primaria. Hemos estado haciendo pruebas beta de la aplicación desde diciembre. Esta aplicación sólo funciona para los estudiantes que están asignados a tomar un autobús de la Corporación Escolar de Goshen, utilizando sólo la parada de autobús asignada para ellos. Esto significa que sólo el padre de familia o el estudiante tiene acceso a la aplicación. Nadie más podrá tener acceso a ésta, sin el número de identificación de estudiante. Si se mudó o su hijo está en casa de la niñera, usted habrá tenido que informarle a la oficina de transporte sobre este cambio para que la información pudiera actualizarse. Al igual que con cualquier programa nuevo, les pedimos paciencia mientras implementamos este programa en todo el distrito. El número del departamento de transporte es el (574) 533-7176. Llámenos si tiene alguna inquietud. 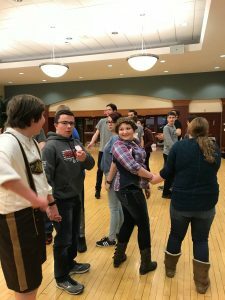 The German Club has been very busy lately! Take a look at just a couple of their recent activities. 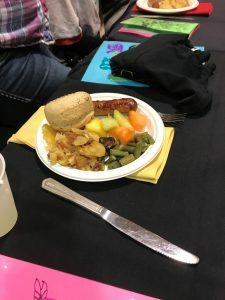 Staatskongress: This is a conference for students studying German from all over Indiana. 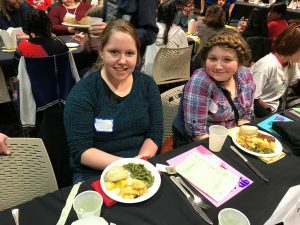 The event is held at Ball State University each year. 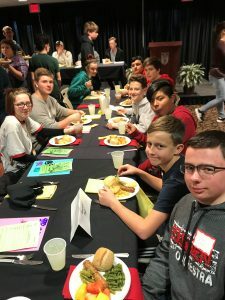 Eleven students from Goshen Middle School and Goshen High School participated in academic competitions and workshops, and they had a traditional German meal for lunch. In one of the workshops, students learned the “Sterntanz” (star dance), and this can be seen in the video (to be posted separately). Congratulations to Grant Miller for earning 2nd place in the Level 1 Vocabulary Bee. 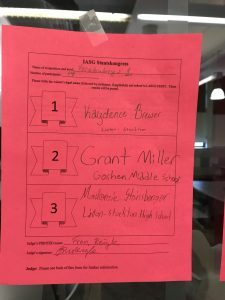 Grant placed 2nd out of 14 competitors from across the state! 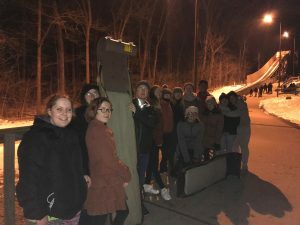 Tobogganing: The German Club also went on a trip to Pokagon State Park last Friday evening after school to get some time to socialize with our five exchange students from our partner school in Bielefeld, Germany. Students had a blast going down the toboggan run! Boys varsity basketball plays in the first round of sectionals at North Side gym against Plymouth at 7:45 p.m. Good luck gentlemen! Congratulations to the orchestra students who performed at state solo/ensemble on Saturday! We had 20 soloists and 18 ensembles perform and all earned a gold with distinction, gold or silver medal. 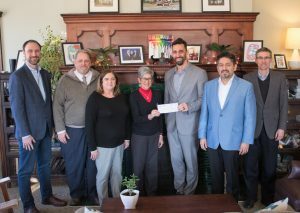 On Friday afternoon, Mayor Jeremy Stutsman presented GCS Superintendent Diane Woodworth a check for $100,000, courtesy of the Goshen Redevelopment Commission. Thank you, Mayor Stutsman, Mr. Brinson, and the Redevelopment Commission. GCS greatly appreciates your support!! Congratulations to all of the students who performed at the state solo and ensemble contest this past weekend at North Central HS in Indianapolis. All students received a gold or silver rating. Congratulations to the varsity winter guard who received 2nd place at the Ft. Wayne Carroll color guard contest. Our JV winter guard also received a gold rating at the Carroll show. Boys varsity basketball was defeated by Marquette Catholic 65-51. Goshen was led by senior Bryant Robinson with 30 points and eleven rebounds. Goshen plays in the first round of Sectionals at North Side gym against Plymouth on Wednesday. German Club Students: Meet at Door M right after school TODAY to go tobogganing. The bus will leave at 4:00 p.m.! On Sunday, February 24th financial aid professionals will be at Goshen College to help students and their families file the FAFSA. This free event starts at 2:00 p.m. in the Union Building. For more info about the event and a list of what to bring please visit www.CollegeGoalSunday.org. If you are a sophomore or junior and are interested in participating in our next Europe Art Trip, there will be a general call out meeting for you and your parents on Tuesday, March 5th in room 1010 at 6:00 p.m. Please see Mr. Zuber in 8080 (or Whiteman Hall) for details. Boys varsity basketball was defeated by Plymouth 36-58. Goshen was led in scoring by Bryant Robinson with 13 points. Boys JV basketball lost to Plymouth in their final game of the season 38-33. Goshen was led by Zach Barker with eleven points. Goshen finishes its season with a 10-11 record. Boys varsity basketball will play at Michigan City Marquette at 7:00 p.m. Go RedHawks! Creative Writing Club will meet TODAY during the 2nd session of SRT in room 2430. We will be doing some further exploration of our characters via poetry and questions. We hope to see you there! Boys basketball will play at Plymouth. JV tips off at 6:00 p.m., followed by varsity at 7:30 p.m. Good luck gentlemen! Goshen High School will host the Elkhart County Career & Job Fair after school TONIGHT from 4:30-6:30 p.m. in Whiteman Gym and it is open to the public. Local employers from a variety of fields will be in attendance with information on current and future job opportunities. Don’t miss your chance to apply for positions for summer work or for employment after graduation. Merit on the Move is a chance for students to earn a credit through Apex for a variety of reasons including re-taking a class to get a better grade, having failed the class previously, or even trying to get a credit or two ahead of schedule. It is open to any sophomore, junior, or senior; however, priority will be given to upper classmen. There is a maximum of 40 students per session, so seating is limited. Merit on the Move takes place on Wednesday and Thursday afternoons from 3:45-5:45 p.m. in the new Apex lab (room 6240 and 6250 – the old weight room). Classes start TODAY and run through May 23rd. We will not be meeting over spring break. Attendance is taken. Students with poor attendance will not earn credits. If you would like to sign up please contact your guidance counselor ASAP. We love our members at the Interra Credit Union RedHawks Branch! That is why we are giving away gift cards to Linway Cinema and Honey’s. There are so many ways to enter! Stop by the RedHawks Branch for all the details. You can get multiple entries! The promotion ends Wednesday, February 27th. The winner will be announced on Friday, March 1st. You can’t win if you don’t enter, so come see us today! Creative Writing Club will meet TOMORROW during the 2nd session of SRT in room 2430. We will be doing some further exploration of our characters via poetry and questions. We hope to see you there! Boys JV basketball defeated West Noble 49-25. Tommy Cartagena Garcia led the RedHawks with ten points. Boys varsity basketball lost to West Noble 55-53. Tickets for the 2019 GHS musical, Annie, are now on sale! You may reserve tickets for this wonderful show by phone at (574) 533-8651 ext. 2518, or by email at musictickets@goshenschools.org. If you email your order, please remember to specify which show you wish to attend, how many tickets you need, and how many of those tickets will be for adults or students. There will be some tickets available at the door for each performance. Performances will be in the GHS auditorium on March 8, 9, 14, & 16 at 7:30 p.m. and March 10, 16, & 17 at 2:30 p.m. The tickets are $10 for adults, and $8 for students. Tickets are for reserved seating, so you will want to order your tickets now for the best seats! The students, directors, and conductors have been working hard, and this is sure to be another great GHS production. Don’t miss out!! TONIGHT is Fan Appreciation Night at the last home boys basketball game of the year. The boys host West Noble with the JV starting at 6:00 p.m. All kids with a current GHS student ID will get two free pieces of wonderful pizza at halftime of the varsity game, compliments of the GHS Student Athletic Council! Goshen High School will host the Elkhart County Career & Job Fair after school TOMORROW from 4:30-6:30 p.m. in Whiteman Gym and it is open to the public. Local employers from a variety of fields will be in attendance with information on current and future job opportunities. Don’t miss your chance to apply for positions for summer work or for employment after graduation. Merit on the Move is a chance for students to earn a credit through Apex for a variety of reasons including re-taking a class to get a better grade, having failed the class previously, or even trying to get a credit or two ahead of schedule. It is open to any sophomore, junior, or senior; however, priority will be given to upper classmen. There is a maximum of 40 students per session, so seating is limited. Merit on the Move takes place on Wednesday and Thursday afternoons from 3:45-5:45 p.m. in the new Apex lab (room 6240 and 6250 – the old weight room). Classes start TOMORROW and run through May 23rd. We will not be meeting over spring break. Attendance is taken. Students with poor attendance will not earn credits. If you would like to sign up please contact your guidance counselor ASAP. Talent Show auditions are TODAY during the 2nd session of SRT in Whiteman gym. There will be a call out meeting for students interested in IB and AP art TODAY during the 2nd session of SRT 2nd in room 1450. The Drama Club meeting has been rescheduled for TODAY during the 2nd session of SRT in room 2100. We’ll talk about One Acts, directing, and acting. We’re looking forward to seeing you all! Creative Writing Club will meet on Thursday, February 21st during the 2nd session of SRT in room 2430. We will be doing some further exploration of our characters via poetry and questions. We hope to see you there! Boys varsity basketball was defeated by Westview 47-30. Goshen was led by Porter Revoir with nine points. Boys JV basketball was defeated by Westview 49-32. Goshen was led in scoring by Jarah Byler with ten points. Boys basketball will host West Noble. JV tips off at 6:00 p.m., followed by varsity at 7:30 p.m. Go RedHawks! Goshen High School will host the Elkhart County Career & Job Fair after school on Wednesday, February 20th from 4:30-6:30 p.m. in Whiteman Gym and it is open to the public. Local employers from a variety of fields will be in attendance with information on current and future job opportunities. Don’t miss your chance to apply for positions for summer work or for employment after graduation. Merit on the Move is a chance for students to earn a credit through Apex for a variety of reasons including re-taking a class to get a better grade, having failed the class previously, or even trying to get a credit or two ahead of schedule. It is open to any sophomore, junior, or senior; however, priority will be given to upper classmen. There is a maximum of 40 students per session, so seating is limited. Merit on the Move takes place on Wednesday and Thursday afternoons from 3:45-5:45 p.m. in the new Apex lab (room 6240 and 6250 – the old weight room). Classes start February 20th and run through May 23rd. We will not be meeting over spring break. Attendance is taken. Students with poor attendance will not earn credits. If you would like to sign up please contact your guidance counselor ASAP. We love our members at the Interra Credit Union RedHawks Branch! That is why we are giving away gift cards to Linway Cinema and Honey’s. There are so many ways to enter! 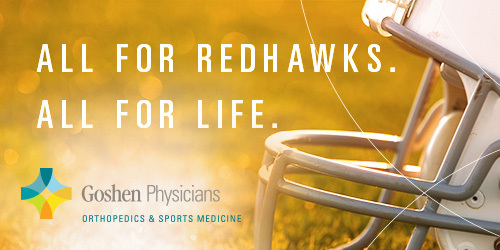 Stop by the RedHawks Branch for all the details. You can get multiple entries! The promotion end Wednesday, February 27th. The winner will be announced on Friday, March 1st. You can’t win if you don’t enter, so come see us today! The Laura A. Kindig Seminary Scholarship is now available. You must be entering the nursing or medical profession to be eligible. You can pick up an application in the guidance office. There will be a call out meeting for students interested in IB and AP art Tuesday, February 19th during the 2nd session of SRT 2nd in room 1450. The Drama Club meeting has been rescheduled for Tuesday, February 19th during the 2nd session of SRT in room 2100. We’ll talk about One Acts, directing, and acting. We’re looking forward to seeing you all! Boys basketball will play at Westview. JV tips off at 6:00 p.m., followed by varsity at 7:30 p.m. Boys sectional diving prelims will be held at Northridge at 9:00 a.m., followed by finals at 1:00 p.m.
Last week we shared a few stories about GCS students and staff that were reported to us. The stories highlighted some pretty great things about the people who come to GCS every day to work and learn. The Goshen community also seemed to appreciate hearing about the good things happening in our school community. So, if you have a positive story about a GCS student or staff member that you would like us to share with the wider Goshen community, please tell us! You may email Lori Martin at lmartin@goshenschools.org and she will pass your story along via the GCS website, Facebook, and Twitter. When you see something beautiful in someone, tell them (and others!). The world needs more of that. VALENTINE’S DAY REMINDER: Please remember to exchange gifts outside of school. You are not allowed to bring flowers, balloons, etc. into school or have those items delivered here. Thank you for cooperating with this! Attention Wrestlers: We will have our end of the season meeting TODAY after school in room 6240, the Apex lab in the fitness room. All must attend and bring a bag to clean out your locker. Prom is just around the corner! If you are a junior or senior and would like to help plan this event, please come to our first meeting TODAY during the 2nd session of SRT in room 8080. Please contact Ms. Poling with questions. As it is the 2nd Thursday of the month, Stay in Bounds Ambassadors have their monthly planning meeting TODAY during the 2nd session of SRT. All Ambassadors are expected to be in attendance as we plan our February visits. Contact Mr. Kissinger in advance of the meeting to discuss any conflicts. Boys swim and dive sectionals will be held at Northridge at 6:00 p.m. Go RedHawks! REMINDER: You have five days to get your eLearning assignments completed and turned in. Did you miss the bear sale from French Club? Well, good news! There are still some bears available for delivery on Valentine’s Day for $4. See Miss Mack or Mr. Hobbs in 2410 to get your special someone a bear for Valentine’s Day! Attention Wrestlers: We will have our end of the season meeting TOMORROW after school in room 6240, the Apex lab in the fitness room. All must attend and bring a bag to clean out your locker. We love our members at the Interra Credit Union RedHawks Branch! That is why we are giving away gift cards to Linway Cinema and Honey’s. There are so many ways to enter! Stop by the RedHawks Branch for all the details because you can get multiple entries! The promotion end Wednesday, February 27th. The winner will be announced on Friday, March 1st. You can’t win if you don’t enter, so come see us today! Prom is just around the corner! If you are a junior or senior and would like to help plan this event, please come to our first meeting TOMORROW during the 2nd session of SRT in room 8080. Please contact Ms. Poling with questions. As it is the 2nd Thursday of the month, Stay in Bounds Ambassadors have their monthly planning meeting TOMORROW during the 2nd session of SRT. All Ambassadors are expected to be in attendance as we plan our February visits. Contact Mr. Kissinger in advance of the meeting to discuss any conflicts. Boys JV basketball lost to LaPorte 47-34. Goshen was paced by Tommy Garcia with 13 points. Boys varsity basketball defeated LaPorte 72-71 in OT. Goshen was led in scoring by Bryant Robinson with 25 points and Porter Revoir with 23. Congratulations to Austin Minnis on being the regional winner at the Career Development Conference! He will be heading to state for public speaking. A big shout out to all of the students who participated…..you all did a great job representing Goshen High School! Congratulations to Yeni Chavarria, Jaquelyn Cordova, and Kaden Sheets for winning the scholastic art competition! Congratulations to the Crimson Winter Percussion Ensemble for placing 1st at the New Palestine competition last weekend! Congratulations to the varsity Winter Guard for placing 2nd at the Zionsville Invitational this past weekend! There will be a Drama Club meeting TODAY in room 2100 during the 2nd session of SRT. Anyone interested is welcome to attend, no prior acting experience or attendance of Drama Club meetings necessary! 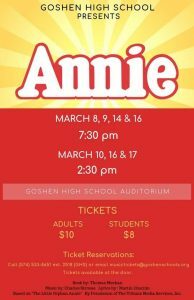 Questions can be directed to staff sponsor Ms. Pobocik at ppobocik@staff.goshenschools.org, or Drama Club president Dani Horn at hornd1@students.goshenschools.org. Prom is just around the corner! If you are a junior or senior and would like to help plan this event, please come to our first meeting on Thursday, February 14th during the 2nd session of SRT in room 8080. Please contact Ms. Poling with questions. Boys basketball will play at LaPorte. JV tips off at 6:00 p.m., followed by varsity at 7:30 p.m.
Students should be back in their regular Apex classroom starting TODAY. Boys and girls track & field season starts TODAY. You should be prepared for indoor and outdoor workouts, and bring comfortable running shoes. We will meet daily in Whiteman Gym for the first four weeks of the season. The boys meet on the wood floor area and the girls on the red floor area of Whiteman Gym. See Coach Willis if you have any questions about the girls team, and Coach Chris Dubois if you have questions about the boys team. You must have a current year physical exam form, cardiac arrest/concussion awareness form, and code of conduct form on file in the athletic office in order to start practicing. See Mrs. Schrock in the athletic office to check on this paperwork, especially if this is your first sport of this school year. There will be a Drama Club meeting TOMORROW in room 2100 during the 2nd session of SRT. Anyone interested is welcome to attend, no prior acting experience or attendance of Drama Club meetings necessary! Questions can be directed to staff sponsor Ms. Pobocik at ppobocik@staff.goshenschools.org, or Drama Club president Dani Horn at hornd1@students.goshenschools.org. Boys freshman basketball lost to Northwood 32-21. Jordan Williams had twelve points for the RedHawks. Boys JV basketball defeated Wawasee 41-33 in the JV contest. Goshen was led by Jarah Byler and Zack Barker with eleven points each. Boys varsity basketball defeated Wawasee in a 2OT thriller 42-41. Goshen was led by Bryant Robinson with 19 points. Freshman boys basketball will play at New Prairie 6:30 p.m. Good luck gentlemen! #ghscares, And They Really Do! Putting on my parent hat. I just want to take a few moments to thank each of you for all that you have done for Ethan this year and years past. It truly takes a village for each of our children and a city to support our special needs kiddos. Thank you for supporting my wish for him to walk at graduation, for him to attend prom last year, the unified sports teams, for always thinking about Ethan’s best interest when placing him with a teacher/para, for the daily communication logs and growth mindsets when he is being a turkey. You have no idea how much you mean to me. (And to Ethan.). Student Alexa Evans also has played a big role in my sanity over the years. Day in and day out she talks about Ethan and how special he is. Long story short, when Ethan and Alexa were at GMS, I was behind Alexa who was walking behind Ethan. Ethan was being very loud (so normal), and Alexa, who had no clue Ethan was my son or that I was behind her said to her friend, “ That kid is Ethan. He went to Prairie View with me and he is my best friend. I love him so much.” Then she said hi to Ethan. I immediately started sobbing. Later I told her how much that meant to me. She has vowed to take him to prom since then. . It’s moments like this that truly make me stop and think about how incredibly blessed we are to live in a community that supports us. Thank you for all that you do not only for Ethan but for all of our children.